SBM Machinery has designed the trestle stand to work with the stationry crusher, screening, feeding equipment for the clients. Trestle stand from SBM Machinery works well with the stationary jaw crusher, cone crusher, impact crusher, VSI crusher, vibrating screen, vibrating feeder etc. We supply the tailored products for the clients. As a professional stone crusher, crushing plants manufacturer in China, SBM Machinery also supply customized trestle for the crushers and crushing plants. 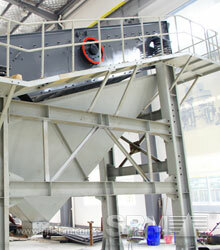 The tailor made trestle stand works well with our crushing machine, vibrating screen, vibrating feeder etc. The trestle is equipped with walks, the outer edge of which is four feet from the rail. The floor of this walk can extend to the ends of the ties, and each walk shall be equipped with a standard railing and toeboard. 4)	More safety and more convenient. Please see the Technical Data of jaw crusher, cone crusher, impact crusher, VSI crusher etc. Please see the projects of stationary jaw crusher, cone crusher, impact crusher, VSI crusher etc.